Oil painting. Lesson 1 by Olga Rybakova. 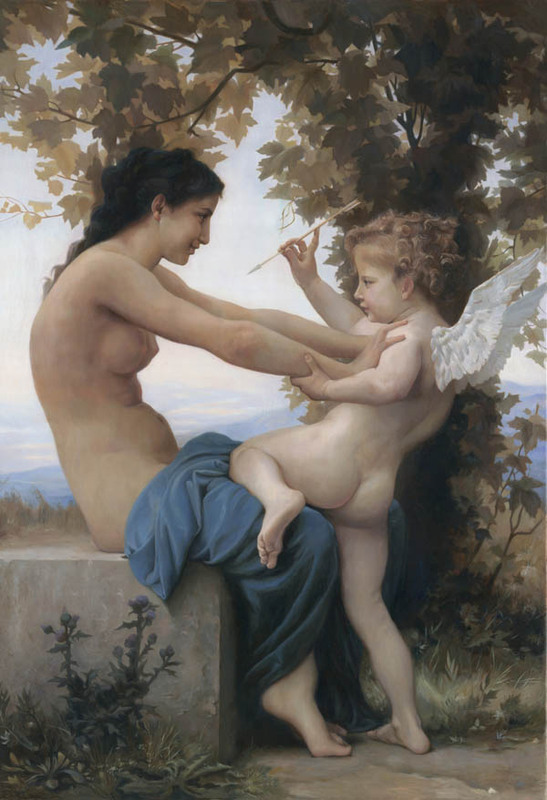 I'll talk about how to copy the paintings Young Girl Defending Herself Against Cupid by Bouguereau. 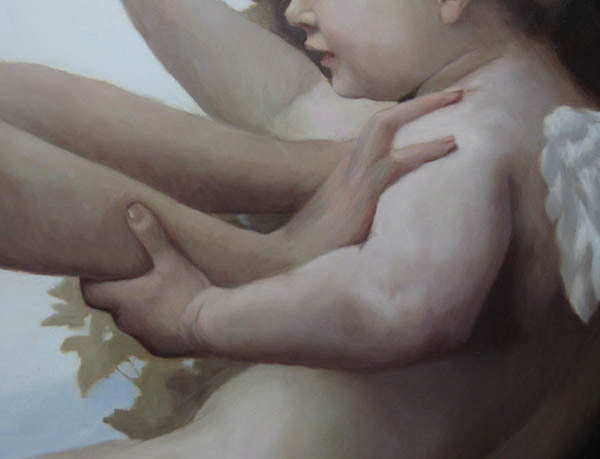 To make copies of oil paintings by Bouguereau is not easy, because he was the greatest master of painting of body skin. In addition, his oil paintings are large in size, it is showed the model of a full-length, and to copy in the original size is a difficult work, but small size will not allow to paint person well and to keep warm- cold relation of skin colors. 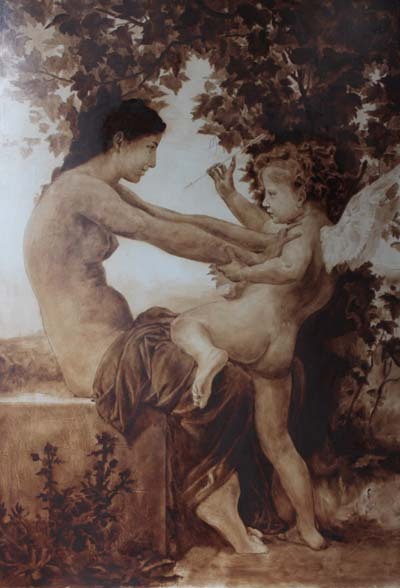 This is my second copy of the painting "Girl, protects against Cupid" and second time I made ? ?the canvas size larger than the first. Canvas is 55x80 cm now. This is 2nd burnt umber underpainting. I usually make so many underpaintings as necessary for the particular oil painting. There are already Imprimatura and two burnt umber underpaintings. This is the most simple steps. I'm moving from left to right and top to bottom, I paint the dead layer. Dead layer of leaves can be colored with ocher, burnt umber. And somewhere to paint transparent, so that after drying appeared through umber underpainting. We want the leaves to stay warm, but it does not come to the forefront, but remained the characters. Do not do the hard boundaries between the sky and leaves. At the stage of the dead layer we paint the sky and not drappirovku blue paint (typical mistake of students), but the black (or a mixture of burnt umber and Prussian blue). it will give a cold bluish tone in a mixture with white. In some places of the canvas we leave untouched the grass that the tone has already caught up with the underpainting. When paint the dead layer I paint additional third underpainting on their faces. Faces, fingers and complex parts are often underpainting more than other places. Write the first color layer of leaves and skythe same time painting the dead layer on the head of a girl and a boy. The first color layer - stone and plants. This layer is necessary to make the shadows of the plants for on the 2nd color layer we could paint plant itself finally . 1st layer of color - we paint the girl's body from top to bottom and left to right to the neck and elbows. I prefer to paint the first body and later face. On the large surface of the body I can pick up paints, and sample mixture, for not to search it for the face. I'll leave the face and ears on the other day to work "with a fresh mind." Come back to it when the body is dry and will not get dirty. Light shoulder: Neapolitan Pink + White + Purple cobalt. the lower half of the body of the boy. The farther we move on to the layers, same area takes more and more time. 1 color layer: neck, ears and face of the girl. I love to paint the ears, especially when the sun shines through them. 1 color layer: hands, face, wings boy. as the wings growing out of the back. Immediately from the skin grow white feathers? Or first feathers in skin color and they turn white as distancing? 2nd color layer: for all the grapes in the painting, I spent 3 sets. 2nd color layer: drapery, stone and plants. This layer should be already making a stone textural. Add different shades -Pink, purple, green, reflexes. we deepen the shadows plants in the foreground of the picture. Update items. we do highlights brighter. I remind you that drapery fabric gives a more contoured and deep shade closer to the boundary stone-cloth. And the further the shadow becomes more transparent and its boundary blurred. 2nd color layer: the girl's body. Remind of reflexes from the sky at the top and bottom of stone. 2 color layer pattern: Hands girls and a boy. The boy's body cooler in color than the girl's hands. Fingers to the nails - blushing, because there are concentrated vessels. On the hands, wrists, and the inner side of the elbow vein can shine, it will give the green and blue hues. It's not the easiest job. I remind you that it is necessary to work out the relief on the bones of the sacrum and spine. Characters sit in the trees, it will give your reflexes - warm yellow-green reflex. 2 color layer pattern: the wings. warm sun gives light, dome of the sky gives a blue shade. Bottom is reddish brown reflection from the back and land. Front wing must be outlined more clearly than the back one. 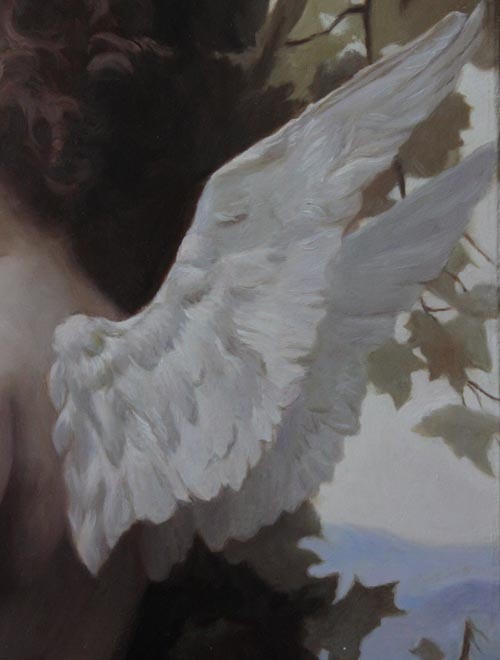 This is scan, so there is no distortion of light and glare - this is the exact image of oil painting. Reflections on the hair. We can paint this and brush number 000, or the fan brush, or brush and old shabby, despite what the highlights and strands we want. Separate translucent hairs on the forehead and around the head. Gently mix them of clean squirrel for to make it more transparent. 2 color layer: the boy's hair. Shaggy curls inspire deep affection for children. They are fuzzy on the contour and sharper in the center of the head. Sky, mountains, background. Glaze the edges of the leaves, if you need to zoom out. Deepening shadows and bright highlights do. Once again, check the border - the sky-body. In the foreground border stiffer in the rear - Fused softer. Accents on the hands and face. Dry the oil painting for a long time. After drying, cover with varnish. So it is complited oil painting in the frame. Work took 3 months to dry. 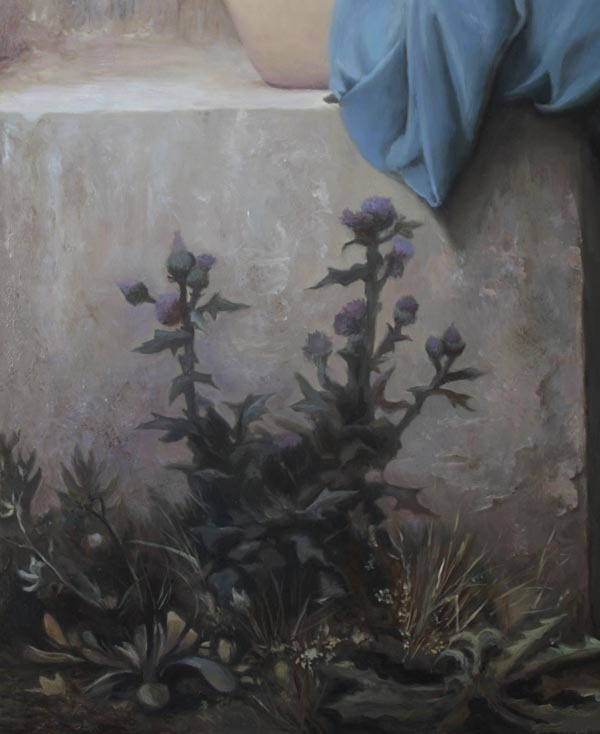 I hope this lesson of oil painting was useful and interesting!